If you are looking to control fungus, bacteria, particulates, dirt, debris, odors and health concerns in your HVAC system and air ducts, we have the services to solve these problems! Power Vac America has been handling your commercial and industrial air duct cleaning and HVAC system cleaning in Houston, Dallas, Fort Worth, Austin, San Antonio, Texas and all points in between since 1991(24 years)! If your employees, clients or tenants have stuff blowing out of the air ducts and covering their desk every day, if they are complaining of allergy and respiratory problems while they are at work, or if they are threatening OSHA or HR complaints, then let Power Vac America help you solve these problems. Power Vac America will clean your air ducts in accordance with the NADCA standards. Source removal is the primary focus of this standard, which means that we will remove all of the dirt, dust and debris that has built up inside of the duct work and is causing these problems. Power Vac America will use the state-of-the-art equipment specifically design for air duct cleaning to clean your air ducts. Does your facility fall under this statistic: “According to the Department of Energy, the typical duct system loses 25 to 40 percent of its energy output due to improper sealing”? 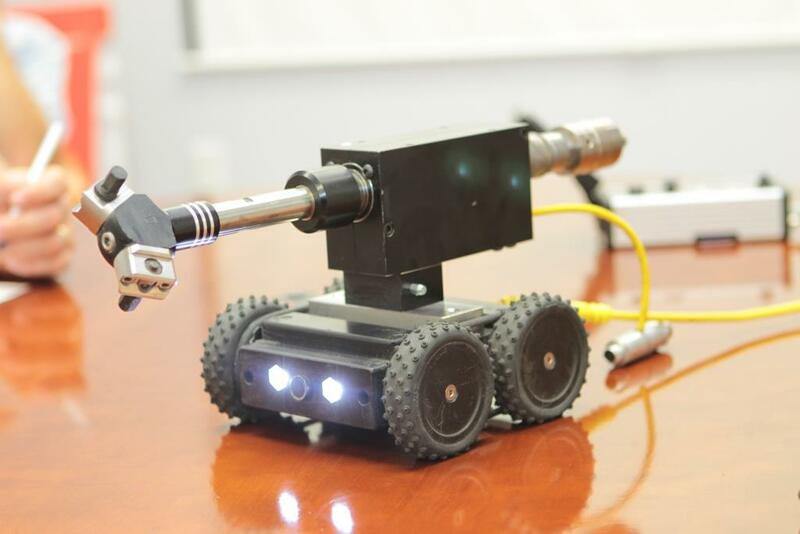 Power Vac America can help you with our HVAC Robotic System. This system helps to mitigate energy loss by fully cleaning and properly sealing your ductwork, resulting in increased airflow and reduced operational costs. 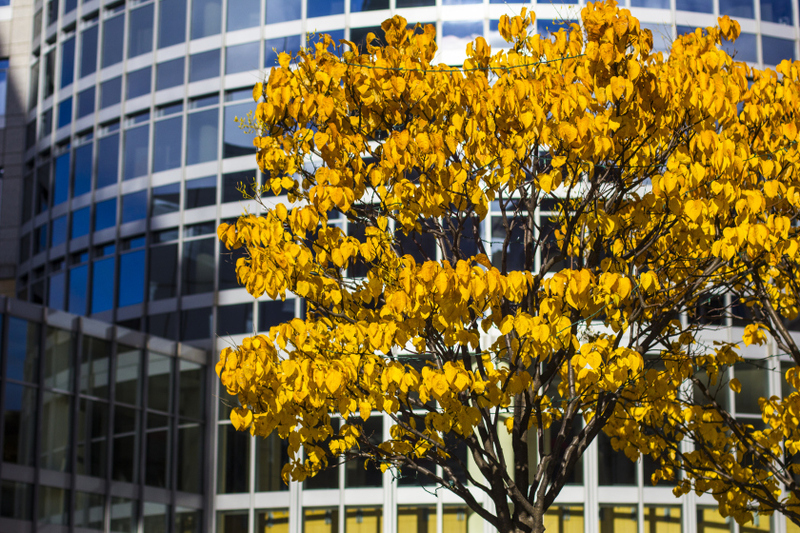 It can also dramatically improve your building’s indoor air quality, purging your system of long-unnoticed particulate. Our HVAC Robotic system can inspect, clean, coat, seal and provide video footage of the process. Follow the link for much more information. Are your employees, clients or tenants complaining of odors and smells coming from the air handler unit when it is running? 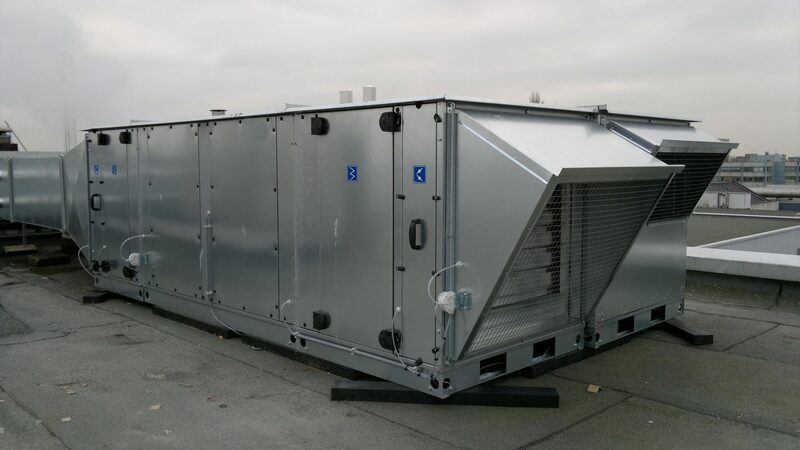 Then you will benefit from a complete and proper cleaning of the AHU in accordance with the NADCA standards. Power Vac America can help you! 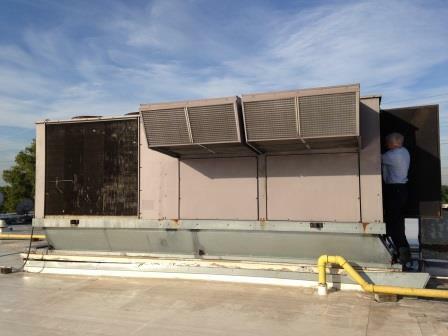 Resurface the internally lined portions of the AHU with either Fosters 40-30 or Carlisle Products RE-500. Both products help prevent future growth of fungus and bacteria as well as help prevent further degradation of the internal lining. Are your Delta-P readings too high? Has your basic pressure washing failed? Is your air flow restricted? Are you faced with the high cost of replacing your coils? Have your cooling coils professionally cleaned by Power Vac America. You can benefit from what we have learned over the years and from the equipment that we have to clean your coils. For your really bad coils, let us steam clean them. Has the insulation inside of your AHU become so old and brittle that you can see the bare metal? Are pieces coming off and blowing down your ductwork? Improve your Indoor Air Quality and have Power Vac America replace the old, brittle insulation with a closed-cell insulation that exhibits superior thermal, physical and chemical resistant properties. These low density products are manufactured specifically for commercial, industrial and residential projects where rubber or fiberglass has been specified. Our trailer mounted, 72 HP, diesel collection units provides 20,000 CFM on negative pressure on the duct work at 40” of water column. This creates a 50 to 70 MPH backward air flow through a 10” suction hose to lift and carry all the organic matter and debris we scrub from the interior of the ductwork out of the structure. 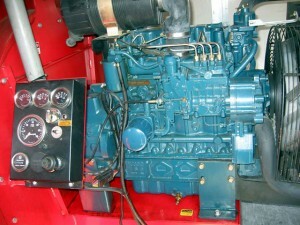 This unit is used on those extremely dirty commercial systems that requires the extra negative pressure. Our 220 volt collection unit is ideal for those projects that require a lot of suction, but have no access for the trailer. Providing 14,000 CFM at 20” of water column with its 10 HP motor. Our most popular piece of equipment for large ships. Power requirements are 220 volts, single phase. Our most popular collection device. This powerful vacuum incorporates two backward incline motor and blower assemblies, which create a powerful combination of vacuum and air flow, making it ideal for commercial air duct cleaning. Creating 5000 CFM at 5” of water column and HEPA filter, it is ideal for most commercial projects. Power requirements are two (2) 110 volts on separate circuits. 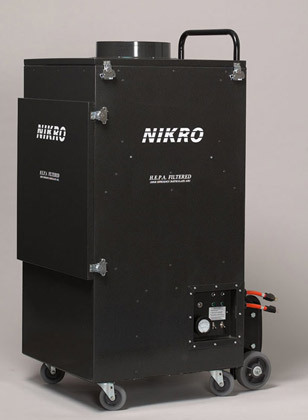 Click here to go to the Nikro website and learn more about these powerful collection units. This 20 HP, gas powered device provides 5250 CFM at 14” of water column and is our primary collection unit for residential projects. This device is trailer mounted and 8” suction hoses are used to create the negative pressure in the ductwork. 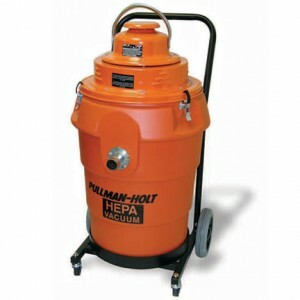 Our HEPA Vacs are used on most commercial and residential jobs. 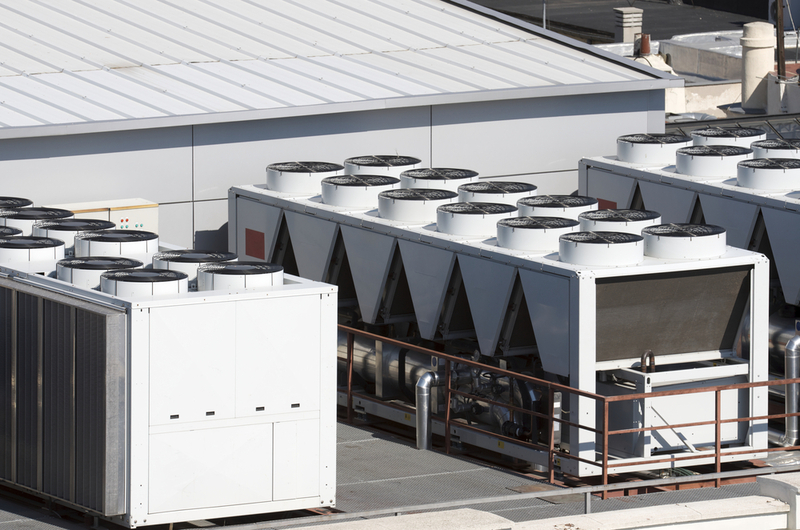 They are used to contact vacuum various components of the air conditioning system including ductwork. They are HEPA filtered for use inside. Powered with 110 volts. Want to know more about our duct cleaning equipment? It’s important to you that we have the right tools for the right job. You want to hire the guys with duct equipment, not tools that would be better suited for painting or cleaning carpets. Duct cleaning is a heavy duty job, requiring heavy duty equipment. 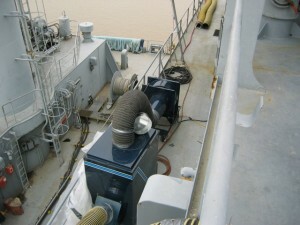 Read more about our highly specialized duct cleaning equipment. What do our commercial customers say about our services? Thank you for sending the very professional crew. Please let them know that we appreciate their hard work and professional attitude. Excellent job performing air duct cleaning for our office. 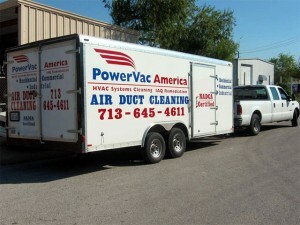 Power Vac’s work crew did a great job in cleaning our office’s air ducts and air handlers. They performed the work without any impact on our business operation. They cleaned up the work area after each evening and in the morning when we arrived to work the floors, desks, and surfaces were spotless – no mess at all. I am very please with the quality of their work. 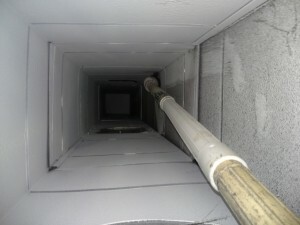 The team at Power Vac have been cleaning our duct work for the past 5 years. The guys work with no supervision from the schools maintenance department. They have proven to be trustworthy, professional and prompt. Our teachers have reported a deduction in allergies and better air quality. We plan to continue to keep Power Vac as a preferred vendor. Timely Quality and Can Do Attitude! Servpro’s Extreme Response Team in Houston, TX has utilized Power Vac America for HVAC air handler and duct cleaning, deodorization and flex duct replacement on retail and commercial fire job losses. We have discovered that Doug Long and his Houston based service group is timely, provides high quality work and always works diligently to meet and exceed Servpro’s clients scheduling and expectations. 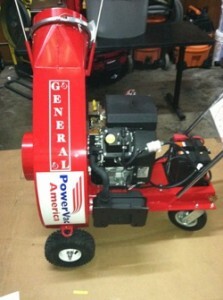 I will recommend and utilize Power Vac America for ALL of my clients losses. Thanks Doug! I have been dealing with PowerVac America for over two years and have never had a bad experience. The owner and folks there have always treated me with respect and helped me understand the process. I highly recommend their air duct cleaning services.